Hyponatremia again hit the headlines fairly recently with the publication of data1 on the prevalence of the condition in IRONMAN finishers in Europe. Worryingly, over 10 percent of athletes tested in a study conducted over the last eight or so years had hyponatremia at the finish line of an event. 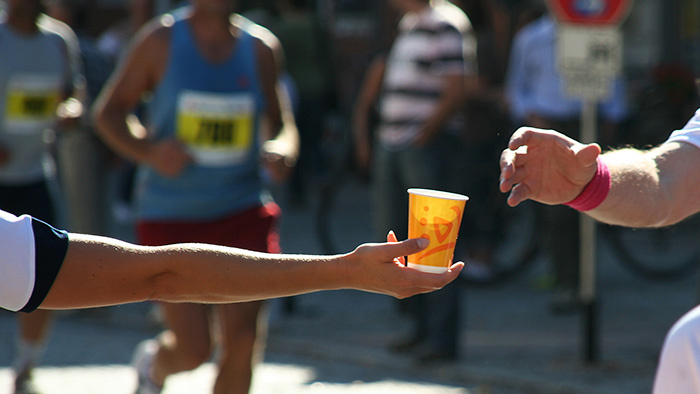 It’s a very important, potentially life and death, topic for endurance athletes to have a handle on, so what follows is an attempt to provide an overview of the basics of hyponatremia and how you can prevent it. Hyponatremia is a medical term describing low (hypo) blood sodium levels (natremia – Na is the chemical symbol for sodium). There are a few different causes of the condition, but the main one of interest to athletes is when dilution of sodium levels in the blood is caused by excessive drinking. This can be exacerbated by the loss of sodium in sweat during prolonged exercise. This variant of the condition is generally known as ‘Exercise Associated Hyponatremia’, or EAH. Because of how finely balanced your blood sodium levels need to be for good health, even mild EAH during exercise is bad news. It can seriously undermine your performance for a long time before it starts to make you properly ill. In severe cases of EAH, the symptoms can potentially escalate into seizures and coma. If things go uncorrected for long enough, the end result can even be death. This is because, in order to try to preserve sodium concentrations in the blood, the body shifts excess fluid it can’t otherwise excrete from the blood plasma into it’s own cells causing them to swell up. This swelling is devastating when it occurs in brain cells and is what leads to the condition becoming fatal. About 14 deaths, including one at IRONMAN Frankfurt in 2015, have been directly attributed to EAH during sporting events since 1981. However, as the results from the recent IRONMAN study show, the occurrence of non-fatal EAH is likely to a lot higher. As already alluded to, for athletes the primary cause of EAH is over consumption of fluids (especially drinks low in sodium) – that is consumption in excess of what can be sweated or urinated out. A popular theory has emerged that the prevalence of over drinking, and therefore hyponatremia, has increased in recent decades because the pitfalls of dehydration have been so effectively publicised since the 1980s. It is thought that this has led a lot of athletes to believe they need to drink well before they feel thirsty, and that a ‘more is better’ approach applies to hydration. In my conversations with athletes I do see many of them routinely drinking very large amounts in an attempt to make sure their pee is clear all of the time, as they see this as a primary indicator of being well hydrated– and that applies right up to the pro level. I feel that there is still a widespread lack of appreciation that too much fluid intake can be as detrimental for health and performance as too little. That said, I believe this is slowly starting to change with EAH becoming a more widely discussed topic in the non-scientific press. Many experts also feel that very large sodium losses in sweat, as a result of high sweat rates over long periods of time and/or the very high sweat sodium concentrations seen in some individuals, can contribute to increased susceptibility to developing EAH. I would agree with that. There are quite a lot of interesting case studies that back this up, both in healthy people with high sweat/sodium losses and those with Cystic Fibrosis, who have a genetic disorder causing them to lose lots of sodium in their sweat. However, it’s also fair to say that this area is the subject of ongoing debate. In theory, avoiding EAH is pretty straightforward, you just have to avoid drinking more that you sweat and pee out, so that severe dilution of blood does not occur. For quite a while some experts (notably Dr. Tim Noakes, with many others following his lead) have been advocating a ‘just drink water to thirst’ approach for this very reason. When healthy people drink water purely to the dictates of thirst during exercise, it’s been demonstrated time and again that they don’t tend to take in more than they sweat out and, as a result, become gradually dehydrated, making EAH all but impossible. This strategy is often backed up with evidence to support the fact that that mild dehydration does not necessarily negatively impact performance. That’s almost certainly true to a degree. However this approach leaves athletes to train or compete for any event, of any length or intensity, and in all conditions, with nothing more than this relatively vague statement to guide their entire hydration strategy. It also ignores the valuable contribution of supplementing fluid intake with additional sodium to help aid fluid retention, maintain blood sodium levels and replace some of that lost in sweat. At a certain point, the usefulness of ‘drink to thirst’ guidelines effectively ends. And that point is probably when you’re exercising for more than two hours, assuming you began well hydrated. Should You Just Drink to Thirst? If avoiding EAH is your one and only objective, then drinking to thirst is probably OK advice to follow. But it starts to get more complicated when you consider the fact that most athletes want to perform at their best, not just survive a race. Dehydration has almost certainly historically been overemphasized. However, beyond a certain point, it can still cause massive performance issues primarily because it manifests in reduced blood volume and increased blood viscosity (thickness), both of which impair cardiovascular function and heat dissipation. Anyone who has become dehydrated and tried to exercise effectively will know this only too well. The negative effects of dehydration are especially relevant in events that are very long and hot (such as IRONMAN events and ultra marathons) and for athletes who are training hard and sweating a lot on back to back days. That’s because, in these scenarios, the volume of sweat and sodium losses that accumulate can be quite dramatic. Simply drinking water ‘to thirst’ on these occasions is not always adequate to maintain blood plasma volume to a degree that’s compatible with peak performance and recovery. It’s a lot more productive to think of dehydration as existing on the opposite end of the scale to hyponatremia, and aiming to strike a balance between these two extremes rather than it being an either/or proposition. It’s long been known that taking sodium in with drinks increases fluid retention in the blood stream. Also, sweat contains a relatively large (and variable) amount of sodium in it, so when sweat output is high, the net loss of sodium can be substantial too. Sodium is a finite resource in the body and, as a result, supplementation can help to maintain both blood volume and blood sodium levels much better than drinking water alone, especially at times when sweat losses are high. Sodium supplementation helps reduce the rate of dilution that goes on in the blood stream when compared to just taking in water alone. This was shown very neatly in a 2015 study where triathletes were given either extra sodium supplements or a placebo pill to take alongside regular sports drinks during a Half IRONMAN race in hot weather. The ‘extra sodium’ group replaced around 71 percent of their sodium losses during the event, with the ‘placebo’ group only replacing about 20 percent. The results showed better maintenance of blood volume, higher blood sodium levels post-race and faster finishing times in the sodium group than those taking the placebo. These esults that are in line with a lot of anecdotal evidence that I’ve come across working with large numbers of athletes in various different types of high sweat loss events. Where I would also go one step further with this argument is in the idea of individualizing your sodium supplementation to take into account your personal fluid and sodium losses. Sweat sodium levels can vary almost 10 fold from athlete to athlete and sweat rates can also vary dramatically (not to mention the differences in sweat rate caused by clothing, environmental factors and exercise intensity). As an example, at Precision Hydration, we’ve sweat tested athletes who lose an estimated 40,000mg (40 grams) of sodium in the course of a single 10 hour IRONMAN event, compared with others who lose just 3,000mg (3 grams) during the same period. The idea that a single strategy of fluid and sodium supplementation could work equally well for both of these athletes makes no sense at all. You can find out how much sodium you lose in your sweat by getting your sweat tested or estimate the magnitude of your losses by looking for tell tale symptoms like heavy white salt deposits on clothing after exercise and craving salty foods after long training session or races. Hyponatremia is a potentially dangerous condition in which low sodium levels occur in the blood. Even at low levels it impairs performance; and in severe cases can be fatal. In athletes this is almost always the result of drinking too much fluid, with high sweat sodium losses possibly being a contributory factor for some individuals. The best way to avoid hyponatremia is to avoid excessive drinking. This primarily means learning to listen to your body and not forcing in more fluid than you feel like you need. Whilst sodium supplementation should not be seen as a way to compensate for over-drinking to avoid hyponatremia, it can be extremely useful in helping to maintaining hydration levels at times when sweat losses are high. It helps by increasing the retention of fluid in the blood stream and maintaining blood sodium levels. Personalising your sodium and fluid intake not only reduces the risk of hyponatremia, but maximise your performance when sweat losses are high. Personalisation is best achieved through a combination of data collection (even getting your sweat testing) and organized trial and error in training and competition.